There's no doubt about it, as soon as it is warm enough, it's time for sandals. When it comes to my girls, it seems that they have inherited my love of warm-weather footwear, as they continually reach for their own sandals as often as possible. Which, unfortunately for them, isn't nearly as much as they would like, as both of their schools prefer that children wear shoes that are closed in the front to protect their toes (not to mention that we live in the Midwest). So, when I was introduced to Clawz Shoes, I immediately knew that these unique, stylish sandals would be the best of all worlds. 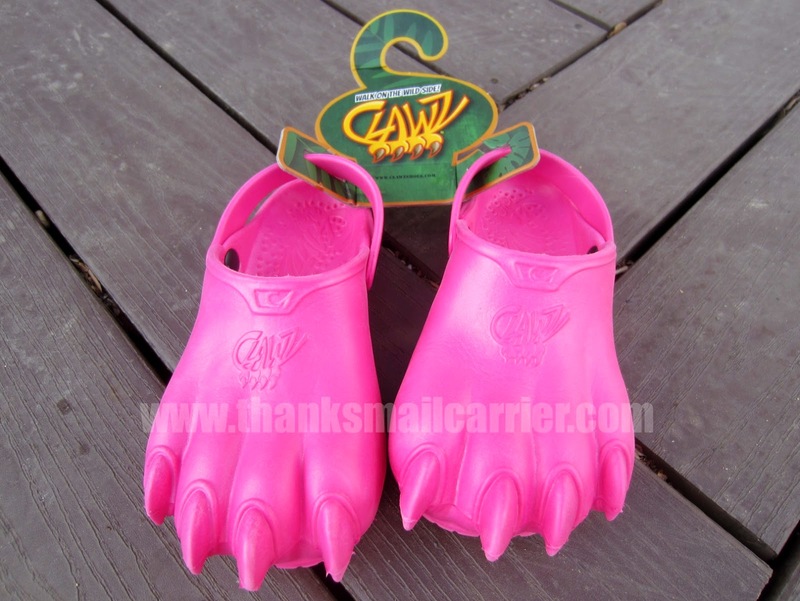 Slip-on shoes that are safe and comfortable in fluorescent colors shaped like animal claws? Sure sounds like every kid's dream to me! Founded with the goal of creating new, fun, and innovative footwear designs, Clawz Shoes LLC has debuted Clawz Shoes as part shoe, part plaything. Why just wear a plain pair of sandals when you can opt for these unique, wild, eye-catching kicks instead? 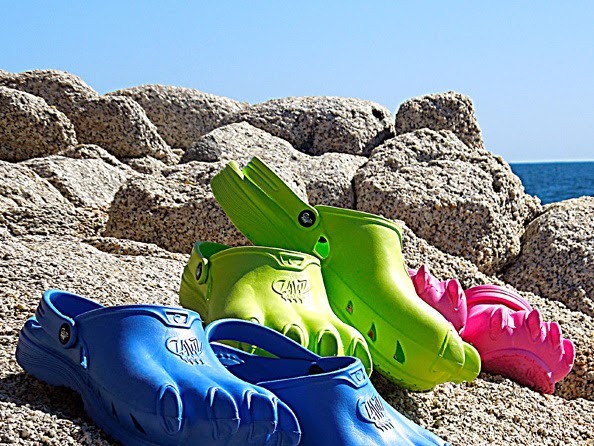 And the wild and crazy fun of Clawz isn't only for kids, these slip-on shoes come in colors and sizes for toddlers, kids, teens and adults so that the entire family can stand out in a crowd. Both young and old can show the animal inside them! 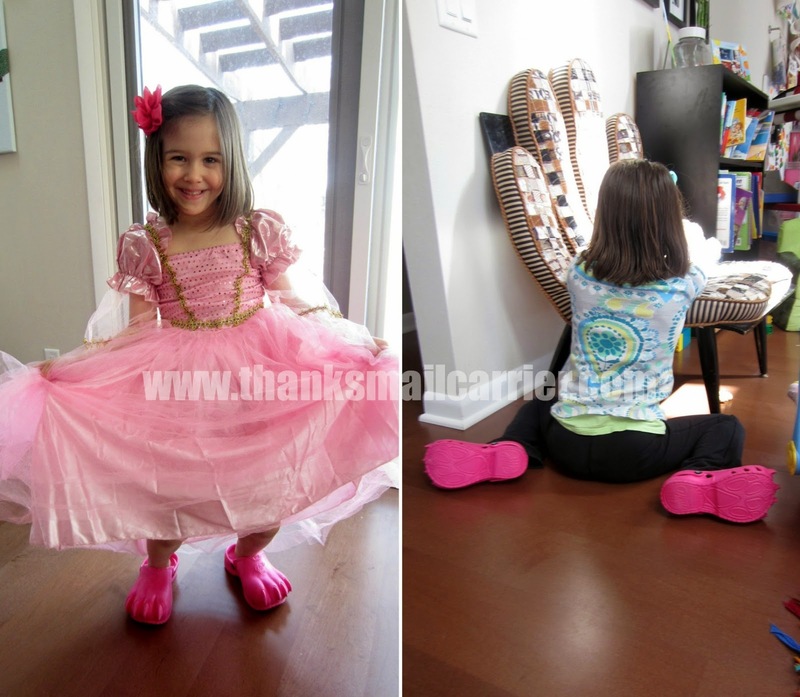 Knowing that these innovative, wild shoes would be perfect for my spunky, energetic 5-year-old, I couldn't wait to see Little Sister B's reaction when a pair of pink Classic Clawz arrived at our house. After using Clawz' convenient sizing guide (the whole process consisted of having Little Sister B stand on a piece of paper and marking the length of her feet. Then, simply measure and compare to the chart) we waited a few days and were extremely excited when we were able to see these shoes in person. Molded from comfortable, durable, odor-resistant material, we immediately noticed that Clawz are extremely lightweight and can be slipped on in a matter of seconds. 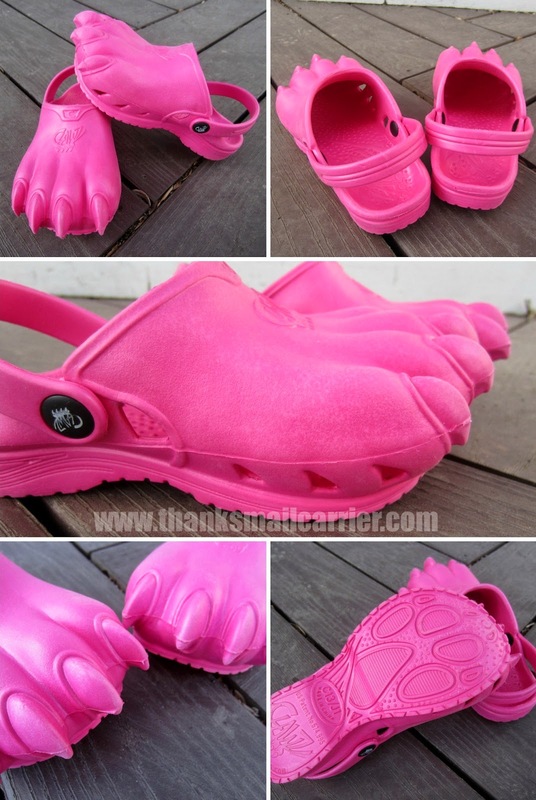 Combine that with the vivid, bright pink color, the soft, yet durable feel, the air vents to keep feet cool, and the overall fierce (but never frightening) look, and I could see why these would be just so much fun to wear... not to mention seeing the double takes they would receive when out and about! I also love that Clawz include a rear strap to ensure that they stay secure while being worn (and while kids are running around acting like... kids) but that the strap can also be folded forward and out of the way for an easy slip on and off look. Just another way to customize these shoes even further! Little Sister B, of course, had her Clawz on immediately and was thrilled to be transformed into a ferocious, savage (extremely cute) beast! 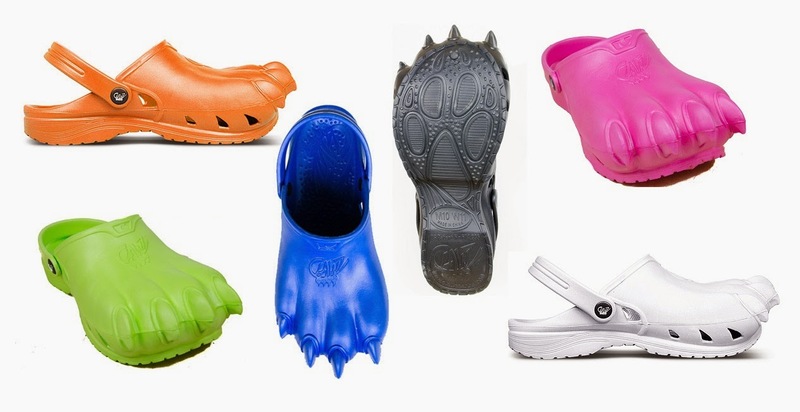 Wild yet whimsical, Clawz Shoes are available in six color options — black, blue, lime, orange, white and pink — and are sure to be a hit, whether worn at school, at the park, at a sporting event, out shopping and much more. While Little Sister B hasn't had the chance to wear these outside too much yet (dang it, Spring! ), she has been wearing them inside the house day after day and we can easily see how these shoes provide a cushioned, comfortable fit. The ergonomic design even molds to the shape of your foot as you wear them so that they continue to feel even better and better! Playing with toys, playing with dolls, reading books, playing games... it's all made better with Clawz! As an added bonus to sporting an adorable and one-of-a-kind pair of shoes, your purchase of Clawz helps support a good cause as well. A portion of the profit from every sale will help fund a donation of Clawz shoes to children struggling with health issues. What better way to encourage children than by giving them a creative, physical way to fight illness with the courage of a tiger or the strength of a bear? Retailing for $29.99 for adults' and kids' sizes and $24 for toddlers' (and free shipping on orders over $45! ), why not pick up a pair or two of Clawz at a discount? From now until May 20th, 2014, enter the coupon code thanks30 and you'll receive 30% off of your order. That brings the price of adults' and kids' Clawz from $29.99 to $20.99 and drops toddler prices from $24 down to only $17.50! Considering the number of times that Big Sister E has forlornly commented, I WISH I had a pair of these, too, I have plans to take advantage of this great deal very soon... and I'm keeping an eye on Clawz for when they begin selling their specially formatted paint markers to customize our Clawz experience even further! Find out much more about Clawz Shoes, including their colors, sizes, philanthropy and more, by visiting ClawzShoes.com and connecting with them on Facebook and Twitter. One lucky person will win their choice of size and color Clawz Shoes! A big thank you to Clawz Shoes for providing a pair of Clawz for me to review as well as the pair of choice for one lucky giveaway winner. The opinions shared are my own and honest and if you really need to see more, click here to see how I roll. These look so fun and different! My 7 year old son would love them. I think they are kinda cute- I work with kids so I would probably wear them then but I don't think I would in a adult setting-LOL! I think they are cute. My daughter loves animals. I'm sure she would love a pair of these. I love that they're different and high quality unlike the ones that are foam. Love the bright colors too. Well, I think I'd rather see them on kids than on grownups! I think they are super cute and fun, and my grandson would love them. Sooo cute and my son would love them! My son would love them. He already has monster feet slippers too! I think these are super cool, and my 7 year old daughter would just love them! love having different things than everyone else! They are a bit crazy but definitely cute! My boys would LOVE this! They look like fun! My grandson would love them! What a cute idea! I'm sure my daughter would love a pair. These look like so much fun! Both of my daughters would love a pair! I like them. I would where them for fun when my grand kids come to visit. They would get a kick out of them. so cool, my boys would love them. I have to admit they are not for me, but I think all 3 of my kids would LOVE them! I think they are cute. My son would flip. They look like a fun shoe options for the kiddos. I don't know that I would wear them....but I would let my kids wear them! These shoes are so creative! I know my sons would love them and I would wear them too!!! These would certainly be conversation starters. LOL I LOVE to be comfy. I will NOT ever ever wear a shoe that is not comfy for the sake of fashion. But I do not think I would wear these myself.. I do NOT like to draw attention to myself! hahaha BUT I know a couple of little boys here who would REALLY love to. And they already love such type of shoe. So I would get these Clawz for them! My daughter would love these, I think they are pretty hilarious. Cray looking, but my grandson would love them! I would like these for working outside. These are fantastic and fun shoes! Love them. 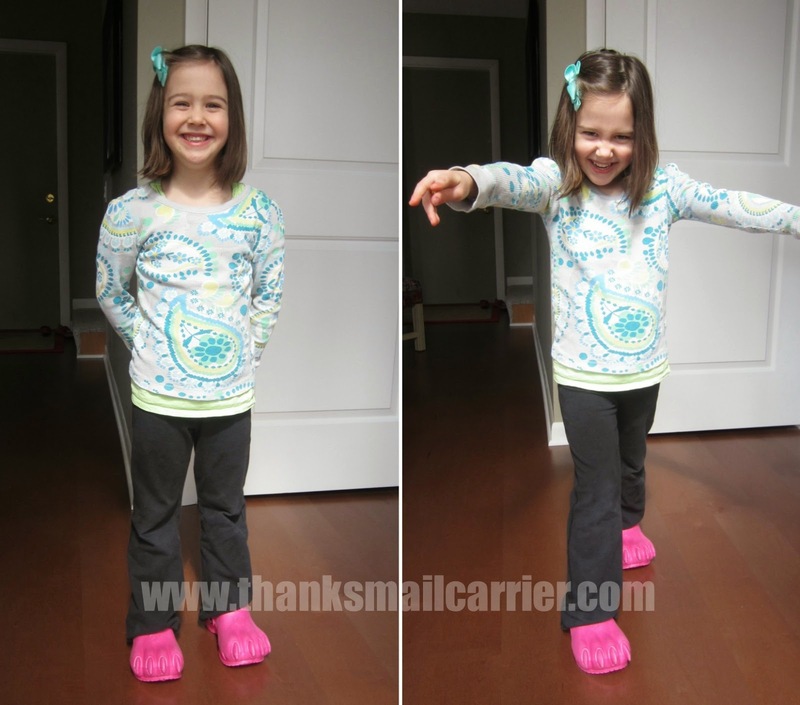 The clawz shoes are adorable and look very comfortable. I think my young nephews would love these so naturally I'd love to win them for those little cuties!!!! Thanks! These look like so much fun. If I won, it would be hard to decide between giving them to my grandkids or keeping them for myself. These are colorful and very unique shoes. You would stand out wearing these! They are interesting but cool. 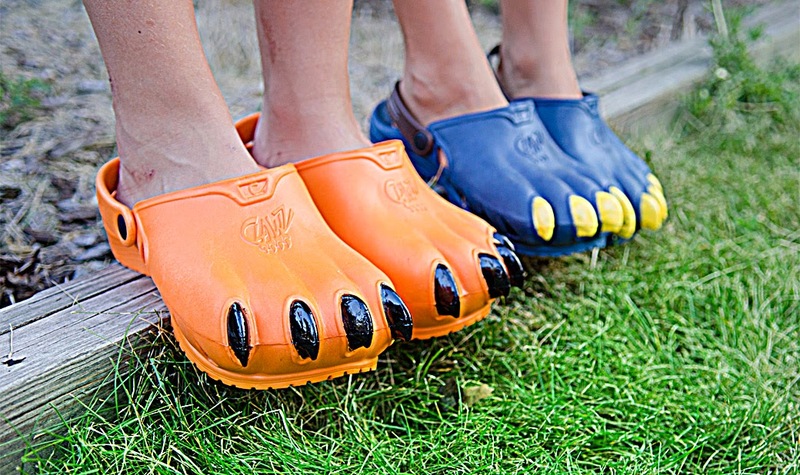 I think my grandchildren would have fun wearing these as they are a bit unique (with the claws). I think my kids would like them!! They are very fun. Kind of Crocs with attitude. As long as they're comfy, count me in. These look like so much fun, most certainly a conversation starter. Very cool shoes. What fun it would be to have a pair that conforms to your feet and they come in great colors. I'm a veterinary technician and these would be a huge hit at work. I live in plastic clogs all the time, so these would just be a step up! I like that they're slip-on & funky. funny shoes..my kids would love them! SO ADORABLE !!! I want a pair for myself !! The first time I saw them I thought that they were fun for kids but I would never wear them myself. But they're starting to grow on me. My 11 year old daughter is reading over my shoulder and thinks they are way too cool and wants a pair. Anyone say birthday present for her? Very unique, I love them and the bright colors! These shoes are so cool looking my son would flip over them! They look comfy too! My little monster would LOVE these. Hot pink monster shoes that she could paint and decorate? Yes, please! And of course, any company that donates profits to worthwhile causes is always a good thing. Thank you for the chance to win! I'd like to win them for my granddaughter. She would like them. I would get a pair of these for my son. I love the fact that they repel odor. His feet can get pretty stinky in the summer. The fact that they mold to your feet is another bonus. These are way cool. My son will love wearing these. I'm not sure I would wear a pair, but my nephew sure would love them. I've never seen anything like these....pretty cool. My kids would love to wear them. I think they are fun! I love the colors! They are so cute and clever! My son would just love them! I think they're cute and unique. They're definitely eye-catching. Thanks. I think they are adorable and that they are something my children would love. I think they are really cute, my son would love them! This would be a great prize for a boating family! I would wear them but I think my daughter would want them more. I love the colors. I think these would be great for wearing to the house (from my hot tub that's outside). I like the holes that are in them so the water from my feet will be able to dry out quicker. These would be super fun for kids! I wouldn't mind wearing them myself around the house or for yard work. I like adding a bit of whimsy to my life! I think my kids would get a kick out of these. I think my boys would love these. So much fun! I'm not sure that i'd ever wear one but my kid would like 'em! I think they look super weird, but the kids would love them. These are hysterical. My nephew would love them. I like that you can customize the colors. They look like something my kids would enjoy. Adorable! My three granddaughters would probably fight over them! I think they are crazy!But great for a laugh. They are Zany and Fun, I like them. They would be perfect for splash pads. these are so cool. my son would think these are awesome. What a great idea, my grandson would love to have a pair of these for the summer. I wouldn't have any problem with him wanting to keep his shoes on his feet when they would look that cool. I like the shoes. They look cool and think my kids would love to use them. oh, i would wear these!! 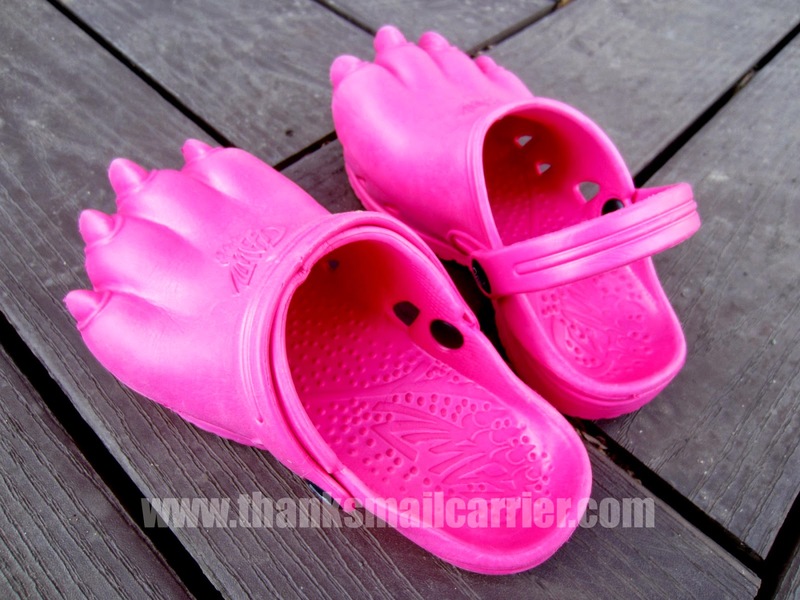 These Clawz shoes are very cute for younger kids. i like these, they are super cute, i would totally rock them! Clawz Shoes are definitely different. I think they are cool and would wear them for sure. I'm think most people would do a double take. They are interesting and the kids will like them. They are fun and I like that they are made from odor-resistant materials too! I think Clawz Shoes look very nice! I'll be honest, I think they are pretty darn ugly but my 3-year old nephew would love them. I think my son would like them. He will soon be 9. I think these are such a neat, fun idea! I think children will love them. I love them too. i think they are the cutest. i would love a pair for my niece and i!